On March 29, 2017 I woke up in middle of the night just like I had been for the past week at approximately at 11:20 PM. I went to the restroom because at 36 weeks and 6 days of pregnancy my bladder clearly could not hold much anymore. Shortly after going to the restroom, my contractions started, and they were STRONG! The first contraction started at 11:41 pm, and the next one was at 11:45 pm, following that one was at 11:51 pm. Looking at the clock frequently, I started to think that I was in false labor and that I would try to wait it out for an couple hours to see how I felt or if they would just go away. I knew I had an appointment with our OB/GYN scheduled later the next morning at 11 am, so I thought I might be ok until our appointment... then at 12:02 AM the contractions became stronger and they were coming in at 2-3 minutes apart. By 12:17 AM, I finally woke up my husband and said "I think I am in labor." He looked at the notepad I had been writing down all the starts times of my contractions on and said "Honey, these are two minutes apart, we should really call the hopsital!" While frantically looking for the number to the birthing center, I kept trying to convince myself that I couldn't be in labor. But the pain was becoming unbearable. As I talked to the nurse that was on call in the birthing center, I explained to her that I wasn't sure if I was in labor or not. I knew I had lost my mucus plug 18 hrs prior (sorry TMI) but didn't believe that I would actually be going into labor so soon after. She asked me if I had to breathe through each contraction and no doubt I had to breathe through each one. She told us that we better come in to get checked out. Again, I explained to her that I had an appointment scheduled later that morning with our doctor and wondered if I should wait until then (WTF was I thinking at the time haha I was in active labor!) but she said nicely.. "Oh dear, I think you might have the baby by then." Luckily, our hospital bags were already packed and still in the car from the week before when we went on a short Babymoon to Wisc. Rapids, Madison, and Chicago for a few days. We finally arrived at the ER entrance at 1:30 AM where they make you still check into the hospital and sign paper work :( I kept thinking to myself how can I sign this paperwork since I'm clearly feeling like I'm dying here. Can the paper work wait until after I push this baby out?! Eventually, we made it up to the Birthing Center, where the nurse began to check us in. They made me step on the scale... exactly what you want to see right before giving birth... NOT haaha meanwhile I am still had contractions 2 minutes apart. I'm not sure how I got myself into a hospital gown, but I do remember I needed Ben to help me change. The nurse asked me to lay in the hospital bed so she could hook me up to the monitors to watch my contractions, but laying in bed was that last thing I wanted to do. Walking around was the only thing that would semi-help me through each contraction, but I wasn't allowed to get up because they still needed check my contractions and the baby's heart rate. After the nurse hooked me up to the monitors, she decided checked to see how dilated my cervix was... I was 8 cm dilated. Hoping there was still enough time, I kept saying, "I want the epidural! I want the epidural!!" The nurse said she would put in the orders for Stadol, a medication that was described to me as being able to take the edge off the pain. But before I could receive that, they would need to start an IV. Sounds pretty simple, and I needed something to ease the pain. The only problem was that my contractions were coming in so strong every 1-2 minutes now, and lasting for about a minute each. Getting an IV started seemed almost impossible in mind. As my primary nurse was on the phone to call in the doctor, she sent in another nurse to start my IV. The first thing I said to the nurse that explained she was there to start my IV was, "GOOD LUCK, I DON'T THINK I CAN SIT STILL FOR YOU!!" It truly felt impossible to try to sit still as each contraction was coming in. I cried to the nurse asking if the contractions were coming down on the monitor... and then she told me she was just an ICU nurse and couldn't tell what the monitors were saying. I begged for my primary nurse as she was still calling for the doctor. The ICU nurse did get the IV started and was able to get me that medication. But for me, the medication just made me extremely drowsy and didn't take any of the pain away from the contractions. Moments later, our nurse came in and said the doctor was on her way. She then let me decide if I wanted to have my cervix checked again to see if there was still even time to get an epidural or if I wanted to wait for the doctor to arrive. Just as she was explaining this, our Doctor walked in... HALLELUJAH!! I quickly asked the doctor again, " CAN I GET THE EPIDURAL?!? I WANT THE EPIDURAL." After reflecting on our birth story, I realize, no one really had the heart to tell me right away, that there was no chance I was getting an epidural. Even the doctor kind of dodged my question and request for the epidural haha! Right when the doctor arrived, she quick checked my cervix, broke my water (which I am surprised didn't already happen) and then told me to start pushing. "Push?!?" I said. "NO! I can't do that!" At that point, I kept trying to explain to them, I feel like I have to poop. Which was clearly a sign that it was time to push the baby out... but I proceeded to explain, "You don't understand. I just had diarrhea at home and feel like I could go again." My poor nurses probably heard that a million times, but I was convinced that if I tried to push, I WOULD POOP MYSELF! The nurses and doctor explained that it would be ok if that happened and that it was time to start pushing. After repeatedly saying the phrase, "OH GOD, THIS IS BULL SH**. I CAN"T DO THIS!" Mostly because I didn't get the epidural...I finally tried to push. On the first push, I SWORE I THOUGHT I POOPED MYSELF! And boy did I keep telling my nurses that! haha But they reassured me that I did NOT in fact poop myself! After about 9 good pushes, Lincoln Dash Ehlers was born at 2:05 am weighing 7lbs 2oz and 20 inches long. Lincoln was born just 35 min after arriving to the ER. 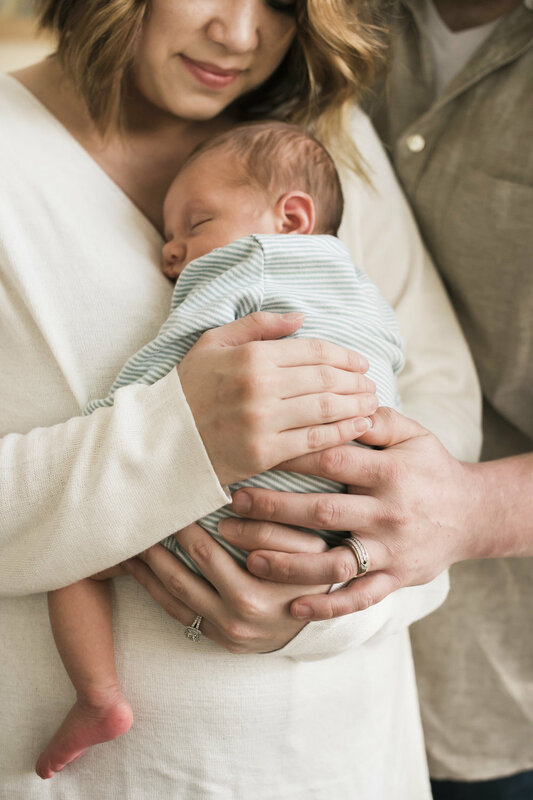 We are so grateful for the entire Birthing Center staff at the Door County Memorial Hospital for the amazing care we received and the helping deliver our baby boy into this world quickly and safely. We are thrilled to have our baby boy in our lives and look forward to sharing more about our journey as new parents! P.S. Since Lincoln was born so quickly, we really didn't get many pictures of him right after he was born, which is why I am finally sharing all our nice pictures from Lincoln's newborn session. But just to keep it real here, below are a few shots my family took with their phones right after his birth.